This special Elton Gnome is being released in conjunction with the new Sherlock Gnomes movie, which features music by Elton John. Due to limited quantities we will not be able to guarantee the availability of this product much after the Farewell Yellow Brick Road Tour begins. A Limited 500 Unit Production of pieces were made of this original Elton Gnome for GardenFun.com. Each statue bears a plated signature of this legendary artist on the piano, and is accompanied by a Certificate of Authenticity. Elton Gnome: 12" inches long by 11.25" inches tall in size. Poly-Stone Resin for added durability. Hand Painted in glitter, ordained with beaded rhinestones. Officially licensed through Paramount Pictures, comes with a Certificate of Authenticity, and is sold exclusively by GardenFun.com! Makes an incredible gift for collectors and Sherlock Gnomes fans alike! Thank you to all the super fans for your endless requests, inquiries and patience on this magnificent garden gnome masterpiece. 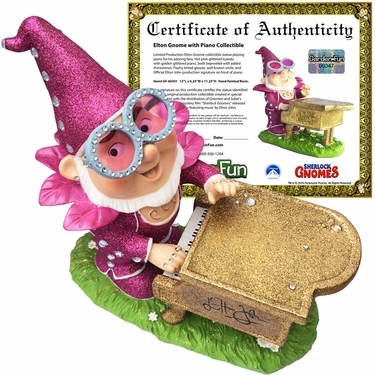 For excited fans ready to own their own Elton Gnome statue, get your order placed now. We have him in stock and shipping!! For safety, each Elton Gnome will ship in a custom 5-ply box and come fully encased in styrofoam protection. Numbered Certificate will be included inside. Each unit is hand-produced and therefore no two pieces will be identical. Variations in color, shading, and texture are inherent, so each single unit is considered a one of a kind.